Just a suggestion for Jaguar, especially when Consumer Reports describes it as a "cramped cubicle". It excelled in other areas by providing owners with a sporty drive experience and sharp handling, but Editor Nick Kurczewski found the interior ambiance and cabin space to be lacking. With an entry level model costing $35,725, he expected to see an interior that looks fun though not in the sense of chrome and wooden dashboards. Just materials more in tune with the Jaguar mystique. 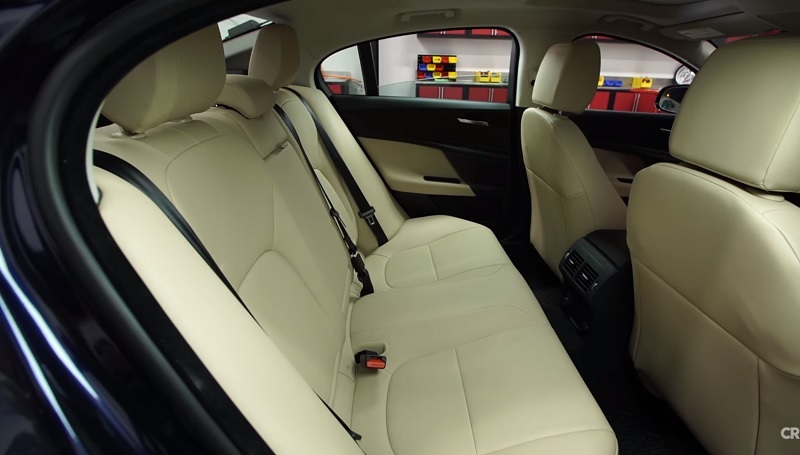 Then there’s the cramped rear seats that are described to be comfortable to children and short legged pets only. Perhaps there is some merit to his claims as head room isn’t great for taller passengers and the already tight legroom could be made worse when sitting behind someone tall in the front. Unexpected considering the fact that it’s 2,835 mm wheelbase is comparable to the Mercedes C-Class and BMW 3 Series. Perhaps to compensate for its smaller cabin the XE features an exciting exterior design, comfortable leather covered steering wheel, 8-inch touchscreen, and a choice of petrol and diesel engines. There’s a fine line between "cramped cubicle" and "corner office"; which side do you think the XE falls into? As someone whose previous car ownership includes a Triumph TR4A, a Toyota Tercel, and a Honda Civic, I understand that small cars aren't roomy inside! As I understand it, the interior dimensions are a bit smaller than other cars of this exterior size due to the aluminum body, which requires more internal structure. The payoff comes when taking a curve, and the light weight aluminum provides. If you want a roomier car, get an XF (which was my previous car). There's no doubt it is a bit tight in the back. I'm 6'1 and I couldn't fit comfortably whoever was driving. Luckily I'm the one usually doing the driving and that seat with the steering wheel is just perfect! Who cares about the passengers lol? They do make that long wheelbase version, the XEL in China. I think it's about 4 inches longer? The extra space would be nice but I suspect it would mess up the lovely proportions of the exterior. And like the above post says, if you want more room, get an XF! It's not the largest, but the rear seats are comfortable, nicely bolstered, so long as you aren't tall like SimEd and the XE lines are just perfect. I don’t think this was designed to be a full time 4-5 pass vehicle. The XE is a driver’s sport sedan and made to drive and handle exceptionally well. It may be tight but it’s not as bad as my wife’s Mustang. I rarely have anyone in the back and prefer it that way.